The 8400 sewing machine cabinet is just in time for today's sewing machines to go on an Epic Journey together! 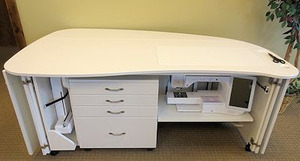 The large desktop with round curves and rounded edges allows fabrics to flow easily as you work with enough room for a 36"x24" cutting mat, even with an embroidery module installed. The largest opening at 30"x16" accommodates the largest machines. The SPACEious leg room and steel supported thin front edge allow that very important "Close-Up and In-Front-Of-Needle" sewing. Dimensions 30" High x 75 5/8" Wide x 45" (30 3/8" leaf down) Deep. Large opening opening of 30" by 16", largest in the industry. 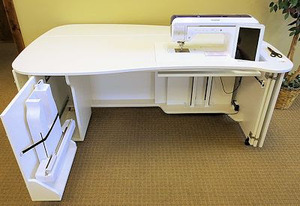 Tons of leg room for easy "Front of needle sewing". Electric lift with Auto-Stop (standard), 5 year warranty, three stop positions (parked, flatbed and free-arm/embroidery). Inside caddy space for a selection of caddy configurations (37,38,39,+). Optional Caddy with Drawers stores inside to save floor space. Hoop storage space 4" behind the caddy space. Large surface area, great for cutting mats. Durable contour laminate top and foot kick for comfort and No snag, no drag sewing. Smooth curves that work with you not against you. Metal frame top support and lift mount. Deep cabinet space (26 inch top front to back minimum, with leaf down). Deep foot kick with 2 1/4" x 24 x 30 storage space behind lift. Bumpers on doors for protection. Colors: White, *Rustic Maple, *Swiss Chocolate (*8% additional charge for these colors). opening for larger sewing machines. 29" x 14” opening for larger Brother XP1 Luminairer and Solaris sewing machines. Large opening of 30" by 16", largest in the industry. Electric lift with Auto-Stop (standard), 5-year warranty, three stop positions (parked, flatbed and free-arm/embroidery). Caddy stores inside to save floor space. Steel tube top support and lift mount. Two large Bi-fold doors with jam protection. Deep foot kick with 2 1/4" x 24 x 30 storage space behind the lift. “THE MOTHER OF THE NEW GALAXY LINE” With our heavy duty Electric Lift the Galaxy 8400 handles the larger sewing machines and their embroidery modules. 30" High x 75 5/8" Wide x 45" (30 3/8" with leaf down) Deep. Opening for the machine is 29 5/8" by 15 5/8". Order Insert 30x16. Bi-fold doors get completely out of the way for getting down to business. The large leaf in the back folds down for flat storage against a wall. The Module Storage Drawer has been incorporated for all embroidery modules. Shown here with an optional caddy, sample embroidery module, and machine, with our heavy duty Electric Lift and Auto-Stop installed standard, the 8400, Quilter's Epic Journey, handles the largest sewing machines and their embroidery modules.